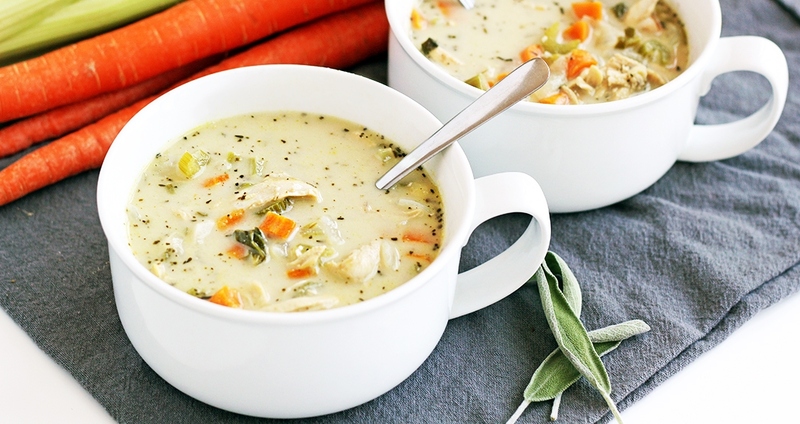 This delicious soup is wonderful on a chilly fall day, and is the perfect way to use up leftover chicken. It also keeps well, so a double batch and pre-portioning can make for easy lunches throughout the week! Add coconut oil to a medium pot over medium heat. Add the onion, garlic, carrots and celery and sauté for 10 minutes, until onions are translucent and vegetables are aromatic. Add 3 cups of the chicken broth, shredded chicken, thyme, sage and salt to the pot. Cover and bring to a boil. Lower heat and continue to simmer, covered, for an additional 20 minutes, or until vegetables are just tender. Blend the remaining cup of broth with the cashews until smooth. Add the blended cashew milk to the pot, along with black pepper to taste. Serve hot.